Today the Open Education Consortium announced the winners of the 2018 Open Education Awards for Excellence, in the categories of open resources, tools & practices. I’m very excited in general about all of this years winners. So congrats to all! 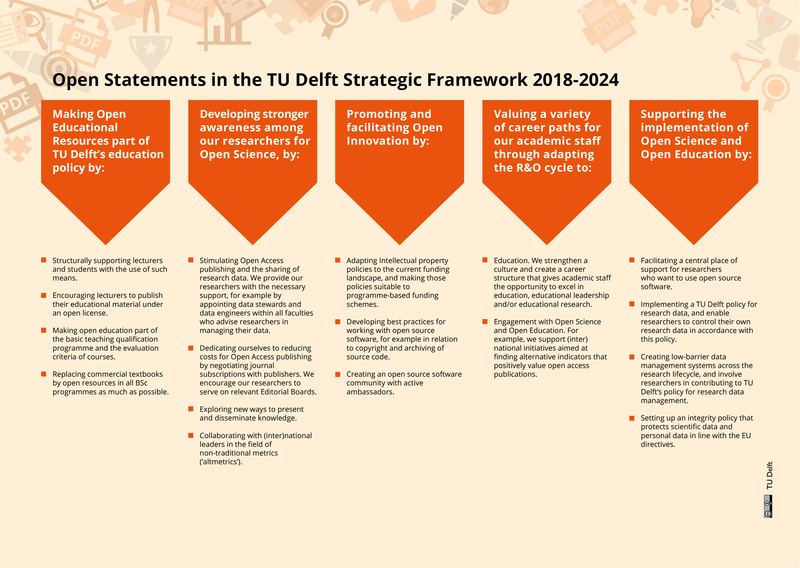 Most of all I am very proud to be able to share that with todays announcement TU Delft received its second Open Education Award of 2018, for our efforts in integrating openness in the TU Delft Strategic framework 2018-2024. This award illustrates our commitment as a university towards openness, not only in education but in the broad range of activities we aim to achieve in the coming 6 years. During the Open Education Week 2018, we organised a succesful Open Education Seminar, where all TU Delft participants actively discussed what next steps could be to continue bringing openness to everyday practice even more. For me, this award also reflects how openness has grown towards a stronger maturity in the last 10 years. In 2007 TU Delft started its first steps in open education. Looking at what we achieved in the past almost 11 years https://ocw.tudelft.nl/10-years/ this award and our efforts towards integrating openness in all layers of our organisation makes me proud. And earlier this year the individual award winners were announced. 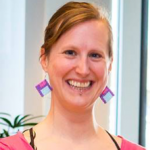 Felienne Hermans will recieve the Educator award for her efforts in opening up access to programming education. To be honoust, this almost needs no introduction. The Open Education Consortium press release says enough. Congrats Felienne! With just about a month to go, we are excited to get closer and closer to the OE Global conference, which we may host this year. Looking forward to a great conference, where amongst others the awards will be handed over to the rightful owners. As you might have seen or heard, the Open Education Consortium and TU Delft will host OE Global 2018 conference at TU Delft Netherlands between 24 and 26 April 2018. We are exited to announce that the theme will be Transforming Education through Open Approaches. The website is now live and the call for proposals is now open. The last day of the Open Education Global Conference has just gone past. So it is time to reflect on what I’ve learned those days. To start off, the conference took place in an amazing venue and the organization was very well done. Compliments to the organizers! 2017 is the year in which the Capetown Declaration of OER celebrated it’s 10th anniversary. For me, running towards the conference, this raised high expectations, expecting to see what the Open Education movement has accomplished since 2007 and to discuss what the future holds. And this did take part in the closing panel discussion on the last day of the conference, where many interesting new directions were discussed. 2 years ago, at the Open Education Global Conference in Banff, David Wiley made a plea for rethinking the movement. Back then, as I recall, he pointed out that the first period of the open movement was heavily aimed at creating and sharing OER. But although this ambition has been and still is very important, this should not be the end goal. In the end OER and Open Education are means to work towards actually transforming education, making it more accessible, more global, more effective (not only from the cost perspective) and more open. Thus, I remember him pleaing for thinking about the next step in the open education movement. Moving from OER to Open Education in all its aspects, including MOOCs, has been an answer we saw happening already back then, two years ago. But now, I think this year the community showed that we have listened. This year, both in the keynotes, in the research tracks, education tracks and policy presentations, such as Cable Green’s vision on next steps for Creative Commons, it struck me that Open Educational Practices and Pedagogy were central to many of the talks and discussions I participated in, or would liked to have participated in. Although definitions on these terms are still developing and so far hard to dot down – where David Wiley and Bronswyn Hegarty have already provided interesting (but not the only) viewpoints – the common ground of applying open aspects to education was clearly visible. This provides an interesting starting point for the upcoming year. And with the current Year of Open promoting openness in all its facets, I have gotten quite excited about what is to come. Hopefully in the next year we will see not only a broader application of Open Educational Practices and Open Pedagogies, but also an expansion of our open values to collaborations with all other open fields, suchs as research, data, software, policy, etc. It appearently proved hard to get to that point this year. Perhaps 2017 was just a bit to early and the Year of Open still needs some traction. The joint approach from open practices and pedagogy and broader cross collaborations on openness, might just hold the key to actually mainstreaming Openness in the fields we work for. Let’s see where the movement is going. And let’s discuss more about this at the next Open Education global Conference, where we are incredibly honored to welcome you at Delft University of technology. “The world is facing challenges that our university of technology alone cannot meet.” With these words, Rector Magnificus Karel Luyben announced the TU Delft Open Science programme at the Dies Natalis 2016. Now, in 2017, the year that the Open Education Consortium has declared ‘The Year of Open’, we are taking another step forward. The aim is to raise awareness among scientists, lecturers, administrators, and students about the importance of open science. In 2016, the focus on open science – that is, making scientific knowledge accessible online to all levels of society free of charge – led to the formulation of the open access policy and the creation of a data framework policy (in other words, policy for research data management). Events like the Open Education Week, the Open Access Week, and the launch of the open science course, helped the ideas behind open science to become more firmly established and integrated. This year, there will be another full open science programme that you too can take part in. Examples include the Open Education Week in March, the launch of the open science course in June, the ten-year anniversary of OpenCourseWare, and the Open Access Week in October. So keep your eyes and ears open and regularly check the website for all the great things that will be happening as part of The Year of Open. The Year of Open is a global focus on open processes, systems, and tools, created through collaborative approaches, that enhance our education, businesses, governments, and organisations, organised by the Open Education Consortium. At its core, open is a mindset about the way we should meet collective needs and address challenges. Last year Robert Schuwer and me developed a workshop to stimulate teachers to think about how to implement elements of open education in their daily educational practice. Based on the workshop we created a toolkit including all the documents we used, enabling you and others to build on and offer the workshop in your own context. We encourage you to use, adapt the toolkit and offer the workshop. And obviously we would love to hear your input! We will present our experiences during Open Education Global in March 2017 and hope to see you there! “Open educational resources, open online courses (eventually “massive”) and open tools like blog, twitter and open forums offer a potentially rich source to use in education. It enables active learning and a more tailor-made approach of education. When teachers are aware of the opportunities open online education can offer, they are able to make an informed choice to use them optimal when designing a course. To enable this, basic knowledge of the many manifestations of openness in education is needed. In the end, their range of teaching methods is enlarged. To realize this, together with Martijn Ouwehand (Delft University of Technology) under the umbrella of the SURF SIG Open Education, we have developed a workshop targeted at teachers who are interested in applying forms of openness into their lectures. The objectives of the workshop are to raise awareness of the opportunities of openness and how to integrate them to achieve the optimal learning experience for the students. Open educational practices offers a base to connect openness to the daily practice of a teacher; this workshop tries to give the ideas more flesh and blood. Expand openness to open tools and open platforms, using an open pedagogy. For this workshop we have adopted a revised version of the definition of open pedagogy by Hegarty. This workshop was organized twice in 2016 under the umbrella of SURFacademy. Feedback from the participants was used to improve the resources of the workshop. This has resulted in a toolkit. The toolkit can be used by those interested in organizing this workshop in their own institution. All resources are published under a CC BY license. The toolkit is available in both Dutch and English and can be downloaded from here. We intend to regularly update the toolkit, based on feedback of users. Feedback can be provided using this form. We hope this workshop will add to widening adoption of forms of open online education by teachers. Vandaag zijn zowel de stimuleringsregeling Open & Online Onderwijs als een workshop rondom de inzet van open leermiddelen in onderwijs gelanceerd. Daarnaast organiseren Robert Schuwer (Fontys Hogeschool) en ik namens de Special Interest Group Open Education na het zomerreces een workshop, waarin we docenten willen ondersteunen om de kansen die open onderwijs biedt te benutten in het (campus)onderwijs, zoals (her)gebruik en aanpassing van bestaande leermiddelen en studenten in contact brengen met een open community middels activerende werkvormen. In de workshop informeren we de deelnemers over deze kansen en dagen we hen uit om deze kennis toe te passen in een eigen lesontwerp (met zogenaamde Open Educational Practices als resultaat). De workshop duurt maximaal 1 dag en wordt 2 keer aangeboden, namelijk op 22 augustus en 13 oktober, maar kent een maximum van 20 deelnemers per keer. Deze workshop richt zich in eerste instantie op docenten die meer willen bereiken met het onderwijs dat zij verzorgen. Onderwijsondersteuners zijn natuurlijk ook welkom. Daarnaast zorgen we er ook voor dat de opzet en de materialen van de workshop beschikbaar komen, zodat onderwijsondersteuners de workshop zelf kunnen toepassen binnen de eigen instelling. De workshop kan erg interessant zijn om je te oriënteren op de mogelijkheden van (her)gebruik van bestaande open leermiddelen, bijvoorbeeld in voorbereiding op de stimuleringsregeling Open & Online Onderwijs. Schrijf je dus snel in. het aantal plekken is beperkt. Open Education Week 2016: Where to go? During the Open Education Week (March 7 – 11), we will organise several workshops and an Open Education Seminar at Delft University of Technology, where you will learn more about the basics of Open Education, how to connect and/or integrate Open Education in formal education and how you could use open education to increase the learning experience for your campus students. This week we the Dutch Special Interest Group Open Education published a new Trend Report on Open & Online Education. It was launched during the annual SURF Education Days conference (Netherlands). This year I (co)wrote 2 articles and participated in the editorial board. In ‘Opportunities to embed open & online education in campus education‘ Judith van Hooijdonk (Zuyd University of Applied Science) and me describe which trend we see in Dutch Higher education concerning reuse of OE(R), and more importantly we describe a number of barriers teachers (seem to) experience preventing them from reusing OER in formal education. During a master class centred around the trend report (during the Education days), we started the discussion how we could overcome these barriers to stimulate the reuse of OE(R) in formal education, and at TU Delft we will continue to work on this challenge. Also, with Robert Schuwer (Fontys University of Applied Science) and Nicolai van der Woerdt (Radbout University Medical Center) I participated in an article on ‘Connecting different forms of openness: seeking a stronger value proposition‘. In this article we explore different forms of openness, such as open research and open source software. We believe that openness only has a shot if we implement openness in different ways towards an open ecosystem where one strengthens the other. It was great working on the trend report again and hopefully it provides useful insights to you and others.